In our partnership with the Upper Cape Technical High School and Cape Cod Baseball League the following rules must be adhered to at Doran Park. We thank you for your cooperation and hope you enjoy your visit! Bleachers and picnic tables are available but fans are encouraged to bring their own lawn chairs as there are plenty of great spots available to see the game! For the safety of all fans, do not interfere with the progress of the game or go onto the playing field at any time. Any fan interfering with a ball in play or going onto the field will be removed from the park and could be subject to arrest. All fans, especially those sitting along foul lines are cautioned to stay alert for hard-hit foul balls or bats that might leave the field of play. Fans with young children or who may not want to continuously be alert should sit behind the fenced/screened areas. All fans assume all risks and dangers incidental to the game of baseball, whether occurring prior to, during, or subsequent to the actual playing of the game. The participating teams, organizations, and players are not liable for injuries resulting from such causes. In 2006 the Bourne Braves began playing at a brand new field located within the Barry J Motta Athletic Complex behind Upper Cape Technical High School. The new location allows for larger crowds and the Braves an opportunity to host CCBL All Star games but most importantly gives our fans a world class field to watch their beloved Braves. 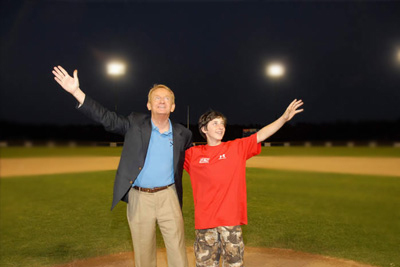 On July 8th, 2007 the baseball field was officially dedicated in the name of George Doran, Sr., a longtime Sagamore Beach resident and avid baseball fan. Doran Park was officially commemorated with a sign unveiling and on field dedication ceremony. Highlights of the day’s festivities included George’s grandson, Patrick, throwing out the first pitch along with his Dad, John, and Katherine Doherty, George’s eldest great-grandchild, singing both the National Anthem and God Bless America. John Doran, son of George Sr., was the family member most instrumental in finding this way to celebrate his Dad’s legacy. In 2008 the Bourne Braves will play their home games under the lights for the first time in Braves history. 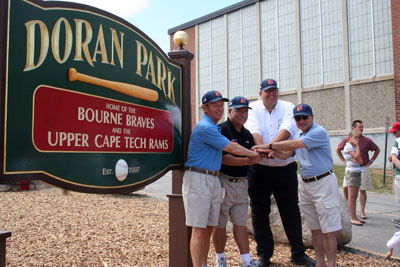 On June 11th, 2008 the Bourne Braves, the Cape Cod Baseball League, Upper Cape Technical High School, The Doran Family and many members of the community came out to celebrate the newly light Doran Park with a Lighting Ceremony. Former Bourne Brave and Boston Red Sox, Lou Merloni, was on hand to address the players are the privelage of playing in the Cape League and relay some stories of his time in Bourne. It was a truly memorable evening at the lights shone brightly at Doran Park for the first time. Here’s where the Cape Cod League’s ten franchises are located. Geographically speaking, the longest road trip (Orleans to Wareham) is 48 miles. Stony Brook, Underpass Road, Brewster – Rt. 6 to Exit 11 (Rt.137). Right at top of the ramp, proceed 2.8 miles on Rt.137, turn right on Underpass Road. Stony Brook School is on the left, the field is located behind the school buildings. Veteran’s Field, Depot Station, Chatham. Center Take Rt. 6 to Exit 10 (Rt. 124)–Right at top of ramp, then 1st left at flashing light (Queen Ann Rd.). Follow across Rt. 39 and Rt. 137, then bear right at “Business District” sign onto old Queen Ann Rd. Take left onto Rt. 28, follow through stop light to the field on left. Whitehouse Field, Oak Street, Harwich Center. Take Rt. 6 to Exit 10 (Rt. 124)–Right at top ramp, then 1st left at flashing light (Queen Ann Rd.). After .3 mile, take right onto Oak St. Follow Oak St. for .8 mile, take left turn just before Harwich High School. Field is on left at back of parking lot. Eldredge Park, Rt. 28, Orleans. Take Rt. 6 to Exit 12 (Rt. 6A)–Right at top ramp, then right at stop light (Eldredge Parkway). Follow for .7 mile, take left just before tennis courts into parking lot. Dennis-Yarmouth High School Field, Station Ave., S. Yarmouth. Take Rt. 6 to Exit 8 (Union St.)–Right onto Station Ave. Follow for 1.4 miles. Take left turn at end D-Y High School into parking lot, field at rear of parking lot. Upper Cape Tech, Sandwich Road, Bourne – Over Bourne Bridge. At rotary, take third right on to Sandwich Road, proceed 1/4 mile to school entrance on right. The field is located behind the school buildings. Take Rt. 6 to Exit 2 (Rt. 130)–take right and follow Rt. 130 to end. Take left onto Rt. 28, then immediate right to Cotuit Center (Main St.). Follow Main St. for 1.2 miles. Take left onto Lowell Ave., immediate left into Lowell Field parking lot. Guv Fuller Field, Main St., Falmouth Center. Follow Rt. 28 South until it becomes one lane. Then take left at 1st stop light (Jones Rd.). Follow Jones Rd. through 1st light. Take right at 2nd light (Rt. 28). Follow Rt. 28 .6 mile to Fuller Field sign on right. Field located behind parking lot. McKeon Field, High School Rd., Hyannis. Rt. 6 to Exit 6 (Rt. 132)–Bear right and follow Rt. 132 through 1st stop light. Take right just beyond Plaza Hotel (Hyannis West End). Cross Rt. 28. Bear left at “To Hyannis” sign. Continue through 2 stop lights and stop sign. Field located behind school building. Clem Spillane Field, Rt. 6, Wareham. Center Field located directly behind Town Hall parking lot.